WHAT YOU SHOULD KNOW ABOUT PSYCH-K ON A QUICK VIEW? Enjoy the soulsoothing environment of the Chateau de La Salle in the south of France! Price: this workshop is a gift: the workshop / your instructors time / the material for free. 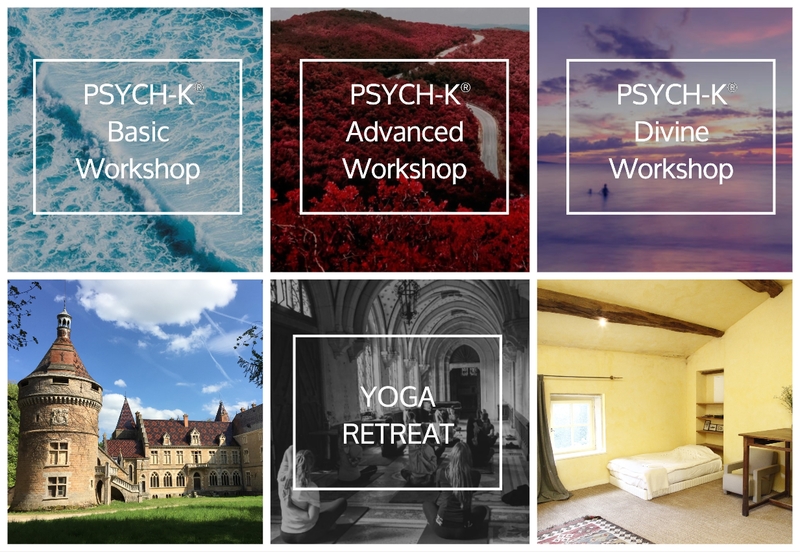 It’s the PSYCH-K policy to offer this Divine retreat for free because we want to contribute to a more sustainable world with peace of mind and life force for everybody – aligned with the principles of nature and ancient wisdom about the law of ‘One’. Your investment: your travel and stay. Relax and rewire to transform. 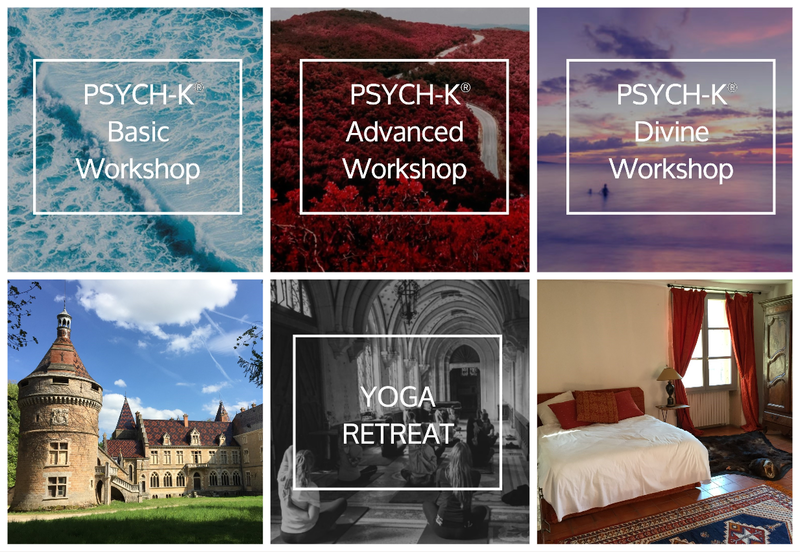 Spend quality time with yourself and like-minded people in Chateau de LaSalle in France! Dates: 22 July: arrival day. Workshop: 23-24-25-26 July 2019. Reduction: if you subscribe for more than 1 workshop there is a reduction. Check it out here. Here Vivia’s personal story and motivation to invite me at the Chateau de LaSalle. ch easier than that! I had already had an experience where I had been on a solo holiday, trying to do some soul searching, and suddenly had a deep understanding of pain and happiness being two sides of the same coin and feeling deep gratitude for all the experiences good & bad, they were all related and ultimately were all LOVE! This understanding changed me immediately for the better, I became relaxed, let go of all the anger I had held on to. This lasted years, I could enjoy and accept my daughters recovery to health without always fearing the worst. But stresses in life crept their way back in and I had no idea how to change my behavior as easily as I had done the last time. Dates: 17 arrival day. Workshop: 18-19-20 July 2019. “I personally came across PSYCH-K® from listening to Bruce Lipton talks and eventually reading his book ‘the Biology of Belief’. I had looked after my daughter who had cancer from the age of 5 month, and was experiencing various burn out issues, that I was trying to resolve through lifestyle choices. It felt like an uphill struggle that was so hard to maintain. I knew it could be much easier than that! I had already had an experience where I had been on a solo holiday, trying to do some soul searching, and suddenly had a deep understanding of pain and happiness being two sides of the same coin and feeling deep gratitude for all the experiences good & bad, they were all related and ultimately were all LOVE! This understanding changed me immediately for the better, I became relaxed, let go of all the anger I had held on to. This lasted years, I could enjoy and accept my daughters recovery to health without always fearing the worst. Due to limited spaces reserve your spot before May 15! 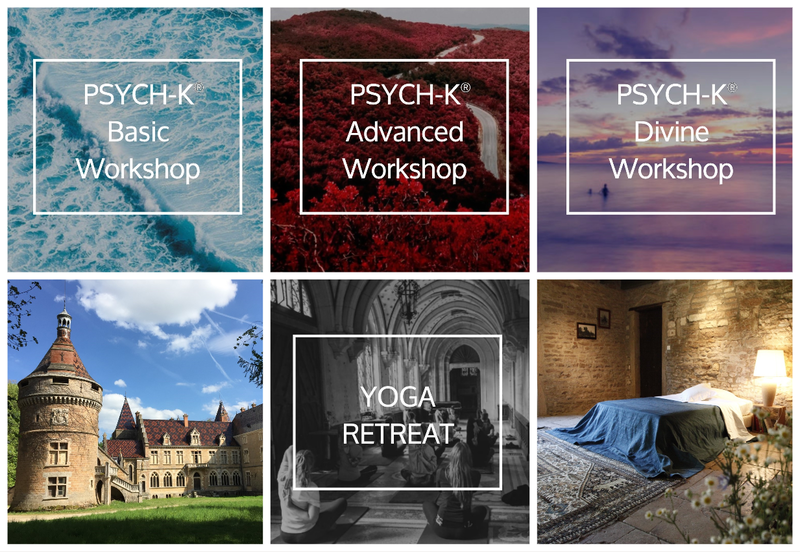 Read all about the GOOD VIBES summer retreat here: immerse yourself: attend 1 or 2 or 3 workshops in 1 journey! Bruce Lipton says “PSYCH-K is one of the most important, efficient, effective and rapid change processes that we have today on our planet.”. He writes about PSYCH-K in his book “The Biology of Belief” (addendum) and in “The Honeymoon effect” (p. 99-100, 126). Basic Workshop PSYCH-K: Poland / Gdansk. Language: English and Polish. 10-11-12 May 2019. This PSYCH-K Basic Workshop is in English with Polish translation by an experienced PSYCH-K Facilitator. Experience the power of changing perceptions about yourself and your reality. Connect to your best self and discover unexpected results. Join us on 10-11-12 May 2019 to experience it yourself. Especially for professionals (coaches, project managers, energy-workers, therapists, osteopaths, healers, doctors and a wide range of other professionals) PSYCH-K proofs to be a valuable add-on. You will receive a certificate for completion that allows you to use PSYCH-K professionally. The group will be small (max 12) for personal guidance and feedback while working on your goals. There will be ample practice time to fully master the processes. access to a Facebook group (sharing; Q&A with peers from your own and other groups). the possibility to publish your professional practice on the global PSYCH-K website. SPECIAL OFFER: because it is the first time we give the workshop in Poland we offer it for the Early Bird fee. Only your registration followed by your payment ensures your spot in the workshop. The Instructor holds the right to cancel of postpone a workshop. Paid tuition will be rolled over to another workshop. Wyobrażenie o sobie oraz miłość do siebie. Kurs jest wyjątkowo przydatny w takich profesjach jak: trenerzy, menadżerowie, menadżerowie projektów, terapeuci, osteopaci, naturopaci, psychologowie, lekarze jak i wiele innych profesji. PSYCH-K dowodzi być wartościowym i doskonałym dodatkiem. Dostęp do grupy na Facebook (pytania i odpowiedzi, dzielenie się informacjami, doświadczeniami itp. z osobami, które znasz ze swojej grupy). Cena: 670 Euro (rejestracja na miesiąc przed data rozpoczęcia Warsztatów). Cena Normalna: 720 Euro. Zapraszamy do Gdansk! Mariette i Beata. Refundacja opłaty za Kurs PSYCH-K jest możliwa wyłącznie w przypadku pisemnej anulacji uczestnictwa wysłanej mailem przynajmniej 14 dni przed datą rozpoczecia Warsztatów. Instruktor ma prawo odwołać lub zmienić termin Warsztatów. Opłata będzie automatycznie przetransferowana na poczet uczestnictwa w następnym kursie. Stress? Tired of pushing yourself without achieving your goals? Is your life not as easy and successful as you would like? The result is stress, anger, or irritation because you do not achieve what you want. Moreover, it makes you tired, or sick. This workshop is for those who want to do something about it. Obviously you are looking for something new and effective, because you have already tried all sorts of things. PSYCH-K definitely sets you free. This is the place to be! Join me in Belgium, to experience this empowering and uplifting event. Price: 670 euro (Early Bird until 1 month before the start) / Normal fee: 720 euro. Changingyourbeliefs holds the right to cancel of postpone a workshop. Paid tuition will be rolled over to another workshop. Become a PSYCH-K Facilitator for creating an easy and fulfilling life; to release stress and to achive your goals. With your skills you can support your friends and family. Especially for professionals PSYCH-K proofs to be a valuable add-on. 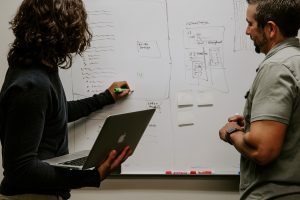 They easily integrate these processes in their practice (like coaches, therapists, osteopaths, energy healers, doctors and a wide range of other professionals). This Basic Workshop is for Dutch speaking people. Can’t find a suitable date? Take yourself to a new level of awareness and expand your transformation skills. Immerse yourself in deep change processes and practice with your peers for mastering these amazing skills! This is the place to learn how to live a wholehearted life! Price: 1030 euro (Early Bird until 1 month before the start). Normal fee: 1095 euro. Vietnamese only sponsored fee: 900 euro. Reduction: if you subscribe with 2 people you can get a reduction of 50 euro. Please wait with booking your travel / lodging arrangements until it is confirmed the workshop will continue. Are you ready to change your beliefs, for a healthy, joyful and successful life? Welcome to the Basic Workshop in Hanoi, Vietnam! Join us in this foundational workshop and learn how to use simple yet powerful transformational processes to empower yourself, using insights of neurosciences, epigenetics, stress management as well as ancient wisdom about mind – body – soul. Of course you want to do something about it. Obviously you are looking for something new and effective, after what you have already tried. PSYCH-K finally sets you free. This is the place to be! Join me in Hanoi, to experience this empowering and uplifting event. Become a PSYCH-K Facilitator for transforming your own issues, to support your friends and family. Especially for professionals PSYCH-K proofs to be a valuable add-on. I work with small groups (min. 6 – max. 12 people) for personal feedback and guidance while practicing the processes and working on your own goals. Bruce Lipton says “PSYCH-K is one of the most important, efficient, effective and rapid change processes that we have today on our planet.”- Dr. Bruce Lipton, 2014. He writes about PSYCH-K in his book “The biology of conviction” (addendum) and in “The honeymoon effect” (p. 99-100, 126). Wait with booking your travel / lodging arrangements until it is confirmed the workshop will continue. Looking forward to co-create this life changing journey! Mariette, instructor. Of course you can look for solutions for every specific situation. Its faster and better to first change underlying patterns to empower yourself and cope any situation. When you communicate effectively about your needs, others listen and take this into account. You feel seen and heard. In the conversation a solution can show up that fullfills your needs even better! Mona got promoted to a project manager position. Although consciously she knows she is fully capable, she lacks personal impact to get things done in the team. In her private session she connects to her needs and values. She is driven by collaboration, being accountable and transparency. We explore how she wants to act in alignment with these values. While we do a few transformation processes, some old hidden beliefs and obstacles surface. Immediately we replace them with new supportive beliefs. Mona has immediate results of these new beliefs: there is a big relief and she feels energized. To confirm the shift I invite Mona to go back to a recent situation where she lost impact and ‘replay’ it. To her own amazement now her communication is totally different. She automatically knows what to say and she expresses herself clearly and focused. Moreover, her whole body language has changed dramatically. She behaves with self-confidence and impact. After a month she reports in the team it’s easy to get things done. She is an appreciated and successful project manager. Sometimes fulfilling your needs can take a surprising turn. For example: Richard tells his partner he would like to go for a walk in the weekends. He wants to sense more intimacy and togetherness. She listens, but it doesn’t happen. Than suddenly the next weekend she proposes to take their bikes for a ride. Now Richards need is fulfilled in a surprising way. She needed some time and Richard had the opportunity to practice some patience. 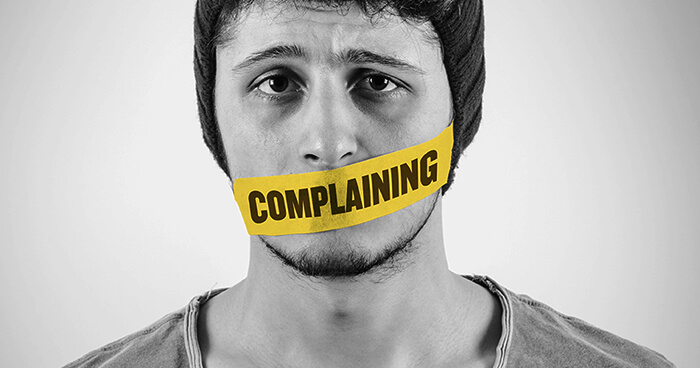 Want to easily move from complaining to empowerment? And download here 50 supporting beliefs for taking action (Free). Inspire yourself with these examples of beliefs about taking action and pick what suits you. Use what works for you to change and integrate these new beliefs and observe how easy you will take action. If you want some assistance, then contact me for a private session, to discover and change any beliefs or emotions that are holding you back from what you desire and want to achieve in life! Early Bird prolonged until Dec 31. Reduction: if you subscribe with 2 people you will get a reduction of 50 euro. Click here to read all about the deep transformational change and the special Balances, results, approach, applications.